Narendra Modi is unwilling to even apologise for the Gujarat massacres because neither religious India nor political India considers his involvement a liability. When Aman Kachroo was murdered by fellow students in a distant medical college in Himachal Pradesh last month, some politicians tried to appropriate his death to the narrative of forcible displacement that Kashmiri Pandits were subjected to by terrorist violence in the 1990s. Had the valley’s Hindus not felt compelled to flee, they argued, young Aman might well have studied in Srinagar, where the academic and social culture would not have allowed such wanton violence to be visited on a student in the name of “ragging”. Despite his death reflecting this invisible dimension of the larger tragedy of exile, however, the Kachroo family asked the politicians to back off. Aman died not because he was a Kashmiri Pandit or because the community was in exile but because of the insensitivity of the educational and law enforcement systems of the country. And his family was determined to make sure the lessons are learned and such tragedies never repeated. The Kachroo family’s dignity and steadfastness reminded me of a meeting I had in September 2003 with a delegation of Kashmiri Pandits from the Hindu Welfare Society of Kashmir. They wanted something to be done to enable the community to return to their homeland without fear. Apart from official indifference, what angered the Pandits was the manner in which “Hindu” politicians had tried to exploit their plight. ”Since 1990, groups like the VHP and RSS have played politics with the fate of the Hindus of Kashmir,” Sanjay Tickoo, a young Pandit from Srinagar, told me. ”Riots were organised in Gujarat in our name. But tell me, what do the poor Muslims of Gujarat have to do with our plight?”, he asked. For Ravishankar to draw a parallel with Indian camps for Lankan refugees was entirely appropriate. I also applaud him for reminding us of the terrible conditions in which thousands of Pandits, who are now entering the 20th year of their displacement, are forced to live in camps in Jammu. But I must confess to feeling bad that Sri Sri, who is one of India’s most influential godmen, missed an opportunity to prick our conscience by remembering the callousness of the Indian authorities towards other internally displaced persons like the Muslims of Gujarat or the Christians in the Kandhamal district of Orissa. During the 2002 riots, the Gujarat government played no role whatsoever in setting up relief camps for the victims. Even today, an unconscionable number of Muslim IDPs there eke out a living under the most parlous of circumstances. And in Orissa, impoverished Christians who want to return to their villages are unable to do so because of the demand by Hindu missionaries that they first give up their faith. Like the Pandits, the Muslims and Christians have also been forgotten by all of us. Ravishankar missed an opportunity to build collective awareness and empathy towards the three groups who are all victims of the Indian state’s indifference. This omission of Muslims and Christians from the story of displacement is, I believe, not accidental or innocent. It is of a piece with the new age guru’s elliptical moral orbit which appears to be drawing him closer and closer to the sangh parivar. One manifestation of this is his pronouncement on various topics like the Babri Masjid. Another is the warning issued to his Art of Living foundation by the Election Commission that its Mantranaad programme in Gujarat not be misused to lend political support to any political party during the ongoing election. The warning was sent following a complaint by the Congress which alleged the foundation was backing the Bharatiya Janata Party. But the omission is also symptomatic of a wider silence maintained by most Hindu religious figures over the blatant distortion and misuse of their great religion by organizations like the RSS, Vishwa Hindu Parishad, Bajrang Dal, Ram Sene, Shiv Sena and BJP. Whenever terrorist incidents suspected to be the handiwork of jihadi groups take place, dozens of Muslim clerics issue immediate statements of condemnation. It is a different matter that our media usually doesn’t bother to report these statements. But when the large-scale killing of Muslims was orchestrated in Gujarat in 2002 by organizations claiming allegiance to Hinduism with the backing of the state administration, hardly any Hindu religious preacher stood up to denounce the profaning of their faith by these politically motivated groups. And this in a region where the concept of ahimsa was born and took deep roots, and where the followers of influential preachers like Morari Bapu or Asaram Bapu or sects like the Swaminarayans run into millions. Is there a connection between this silence and Gujarat Chief Minister Narendra Modi’s refusal to speak when he was asked by a persistent television reporter whether he intended to apologise to the country for the Gujarat killings in the same manner that the Congress party now had for the 1984 massacres? Mr. Modi first replied that he had already given many interviews. When the reporter asked what he meant, he kept silent. When the question of an apology was again raised, he remained silent and gestured for a glass of water. And he refused to utter a word on the subject. When those who are tasked by the almighty to introspect prefer the comforting shores of silence, why should a mere politician be any different? Now we are told that the BJP will create a regular “consultative mechanism” with religious leaders if it comes to power. In a letter to “1,000 religious heads of all denominations”, the party’s prime ministerial candidate, L.K. Advani, said that a government he heads would “seek on a regular basis” their guidance “on major challenges and issues facing the nation”. Among the two names the BJP confirmed sending this letter to was Sri Sri Ravishankar. The other was Baba Ram Dev. Were such a “consultative mechanism” to ever get established, it is unlikely that the spiritual heads who stuck to their vow of silence during Gujarat or Orissa would remain tongue-tied. Apart from making a mockery of the constitutional separation of religion and state, as the Left parties and the Congress have pointed out, this mechanism could easily metamorphose into something truly malignant. As in Pakistan, where Sufi Mohammed has tasted the sweet blood of appeasement, the opinions of our seers on everything except the misuse of religion in politics will flow thick and fast. When Mr. Advani was presented with a “lifetime achievement award” by NDTV in January, he was asked by Prannoy Roy what he considered his greatest accomplishment to be. The BJP leader said it was the rathyatra he led as part of the Ayodhya agitation. That agitation led to the demolition of the Babri masjid, an event that Mr. Advani had once described as the “saddest day” of his life. But when Prannoy asked what was the one thing he regretted about his life, he said it was the fact that he belonged to an occupation where so many of his peers were corrupt! What explains Mr. Advani’s unwillingness to introspect over how his greatest accomplishment could have ended in that “saddest day”? Could his unwillingness be the product of our unwillingness to ask such questions? Everyone agrees that the presence of Jagdish Tytler at the scene of an attack on a gurudwara in 1984 is enough to render him ineligible for public office. And yet we do not regard the presence of senior BJP leaders at the scene of the mosque’s demolition or the burning of Gujarat as being enough to morally disqualify them for the job of Prime Minister. Is this because the Congress party has more of a conscience than that of the BJP? No. It is because influential sections of our society – corporate leaders, religious personalities, media commentators, strategic analysts and everyone else who is in the business of forming and influencing the groupthink that goes by the name of ‘public opinion’ in India – do not consider 1992 and 2002 as crimes on par with the 1984 genocide of the Sikhs. Unless that changes, we can forget about apologies and remorse. As for justice, I’m not holding my breath. The very point that Siddarth Varadarajan is trying to make has been proved by the replies to his post. We may not understand the pain of being a minority unless we are one. By the way, do the ‘intellectuals’ show the kind of unbiased mindset when it comes to criticising extremism? Do they mention the travails of Pandits everytime they talk about Gujerat? Is hate speech perfectly okay if it is targeted against Hindus, their scriptures, or selected Hindu castes as it happens regularly in the state where Mr. Varadarajan hails from? (And for whom, incidentally his own newspaper functions as propaganda arm). So it is just Sri Sri (who along with several other godmen, I do not approve of) who has to take care to mention Kandamal and Gujerat everytime he talks about Pandits. Your article brings out a feeling of hope in me. There are, and always will be, educated professionals like you who are willing to speak up against immoral inaction. I thank you for your article and I remain one of your many fans in this country. It is an excellent article like your other articles. Your unbiased approach to the involvement of religious figures in politics forces us to think and contemplate on the future of India. Our silence to injustices may harm our country and society. It was sad that government caved in to the demand of Muslim religious and political leaders in case of Taslima Nasreen. your article makes me feel sad and feel very bad about ..the way our system works ! it looks from the outset..that our system of governance and democracy is just in a motion of inertia..but not in a motion pushed by force..fair governance and democracy..! hope better times roll in our lives in days to come ! We appreciate your commitment to humanity and dedication to speak up for just causes. Very few people have the courage to do the right thing. A very impressive article about the fanatics; hypocrisies of politicians. The last paragraph on Advani was a perfect ending to a very nice article. I have gone through your article on displaced Kashmiris, Oriyas and Gujaratis and liked your frankness. Thanks for this article which shows the double standard of our politicians. We salute you for such a nice article in “The Hindu”, which reflects the true image of our Great Secular Nation. I read your excellent article Where silence…Justice will not, May 02, 2009. I still have faith in Indian democracy and hopeful that one day rule of law will prevail in my country when victims of all forms of discrimination and injustice will have access to justice as a matter of right. Thanks for being guiding force for all marginalized and weaker sections. Your article was very heartening, touching and saddening. I don’t have words to express my feelings. I have only tears. Thank you Siddarth! Keep the good work. BJP is secular and Congress is not. All BJP is saying is that there should be a uniform civil code so that all Indians can have only one wife. Presently, muslims are allowed to have upto 4 wives in india. BJP also wants to get rid of subsidized haj trips to Mecca. India is 80% Hindu and why should majority Tax payers who are Hindus subsidize with their hard earned money Muslims trip to Mecca? What are Hindus getting in return? After all, Congress Govt. cannot even guarantee Hindus safety during Amarnath yatra and even a simple land request for temporary basis was rejected in a hindu dominated country. Also, Kashmiri pandits are living as refugees in a country which is supposedly 80% Hindus. Congress does not care of Muslims, all they want to do divide Muslims by giving them freebies and come to power. Muslims represent a vote bank, if tomorrow Scientologists represent a sizeable vote bank, Congress will drop Muslims like a hot potato and ask Hindus to pay subsidies for Indian Scientologists trip to Tom Cruise’s house. And for the final topic of mosque in Ayodhya, it was falling apart and would have fallen on it’s own and besides there have been more than hundreds of temples that were destroyed in Kashmir. Extremely pertinent article. Any government that speaks only for one community is abdicating responsibility. What we need are not only regrets, but justice of the nuremberg kind, under international law that is not subject to electoral fears. You writing is clear but the message which you want to spread is on wrong shape. Definitely what happen in Gujarat was a misery and it will forever but why you dont try to look deep in the issue. The issue is not that Godhra happened the real question is why Godhra always( kind of) happened? Have you ever seen in history that how communal scene of India been changed by your dearest party? The whole nation seems to move on a rift of Divide and rule….according to the article 30 of Indian government minorities are allowed to run their own education institution and worship place without any interfere , but when it come to Hindu organization to Hindu temple whole government is open to take over them , Muslims and christen are allowed to manage their own place of worship, versus Hindus are not , is that we are talking about a nation which preach in world democracy and secularism , can you ever imagine this to be happening in any other democracy , or the nation which is preaching Human unity ? This is one example only. My dear friend Siddhartha if you have time try to see how we are divided. Writing article and imposing the misery on someone else is easy but to try to struggle against the miseries is hard. I like your blog though i do not like your ideas but i appreciate your writing. If you can put more and more unbiased truth in it …..i wish you will be real man of this nation which we dot not so many now. Siddharth – How can you continue to display such childishness forever? Don’t you know that for a political to “take responsibility” for the failures of his government is equivalent to committing political suicide? The Congress party has ruled India for more than 40 years and there is still poverty – so will the party or Sonia Gandhi or Manmohan Singh “take responsibility” for poverty on their party’s behalf? In my opinion, if there is one party that is more responsible than others for the dismal state that is India, it is the Congress. Yet, journalists like you have no scruples openly displaying your biases. Everyone very well knows that you as a journalist are not objective and have your own set of biases and hidden agendas. How about you “take responsibility” for defaming your profession? The polarisation evident in the comments that your articles elicit should be a shame for you as a journalist. I think you should “take responsibility” for the sad state of affairs in Indian journalism. Modi and Advani condemned and expressed regret years ago. That is not the issue. But they have never acepted responsibility for their action and inaction. That is the point. 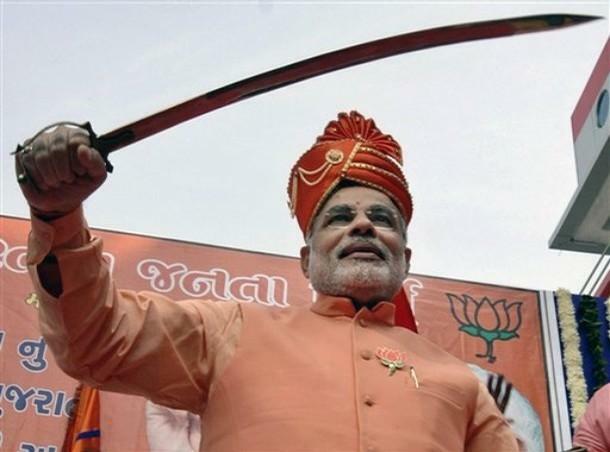 Back in 2005, in a TV interview, Modi has publicly condemned the Gujarat riots. < HREF="http://timesofindia.indiatimes.com/articleshow/msid-1062677,prtpage-1.cms" REL="nofollow">Here is the 2005 report in Times of India<> (I am not sure if The Hindu reported this). Advani has also expressed regret. < HREF="http://timesofindia.indiatimes.com/articleshow/19979183.cms" REL="nofollow">Here is that report.<>No point in repeating it in all the interviews. Modi very well knows that anything he says will be misinterpreted and hence the best thing to do is stay silent. Hope Modi is the PM of India one day. This entry was posted on May 1, 2009 by Siddharth Varadarajan in Communal Violence, Indian Politics.